For an optimal indoor climate, air humidity is crucial. Research and advice of medical specialists indicates that for health and comfort, a relative indoor humidity of 40 to 60 percent is desirable. If indoor air is too humid, our quality of life can be very negatively influenced by mould spores, allergens and problems with the respiratory tract. 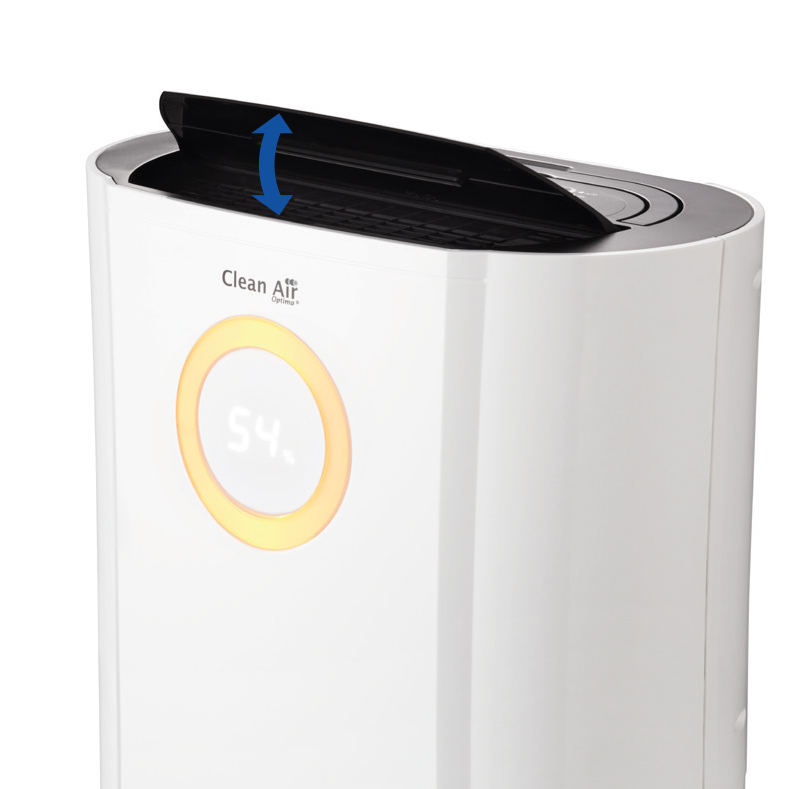 The multifunctional Clean Air Optima CA-704 is an high-effective 2 in 1 system: dehumidifier and air purifier! Using the multifunctional air dehumidifier CA-704 by Clean Air Optima with its 2in1 system for air dehumidifying and purification prevents high humidity and corrosion, damaging by condensation as well as ice and mould formation. It prevents unwanted bacteria growth, reduces odours and effectively helps to dry existing and new buildings. 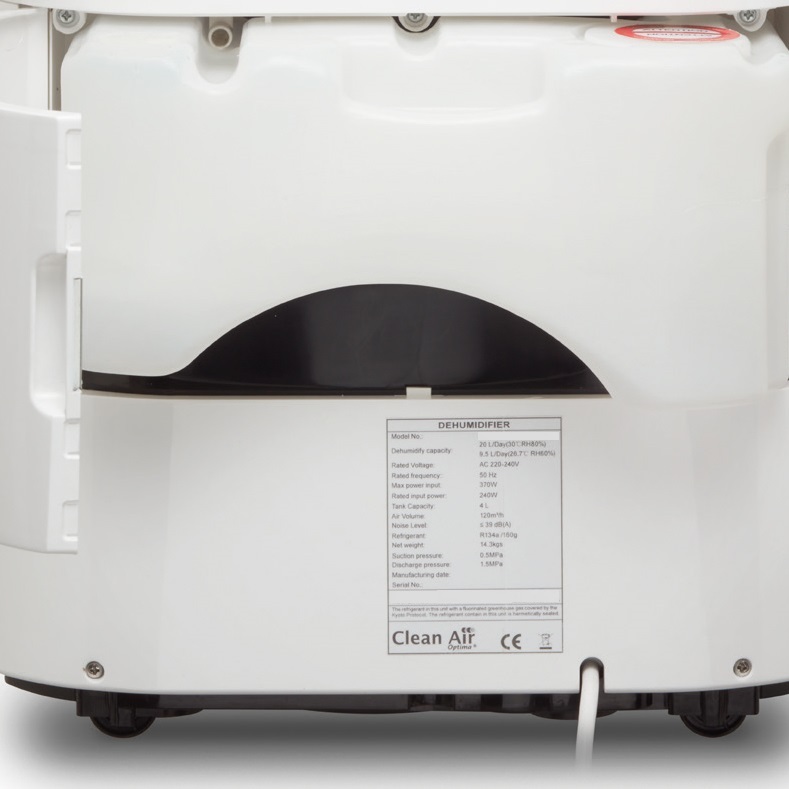 The strong Clean Air Optima compressor dehumidifier CA-704 fights rust and mould! 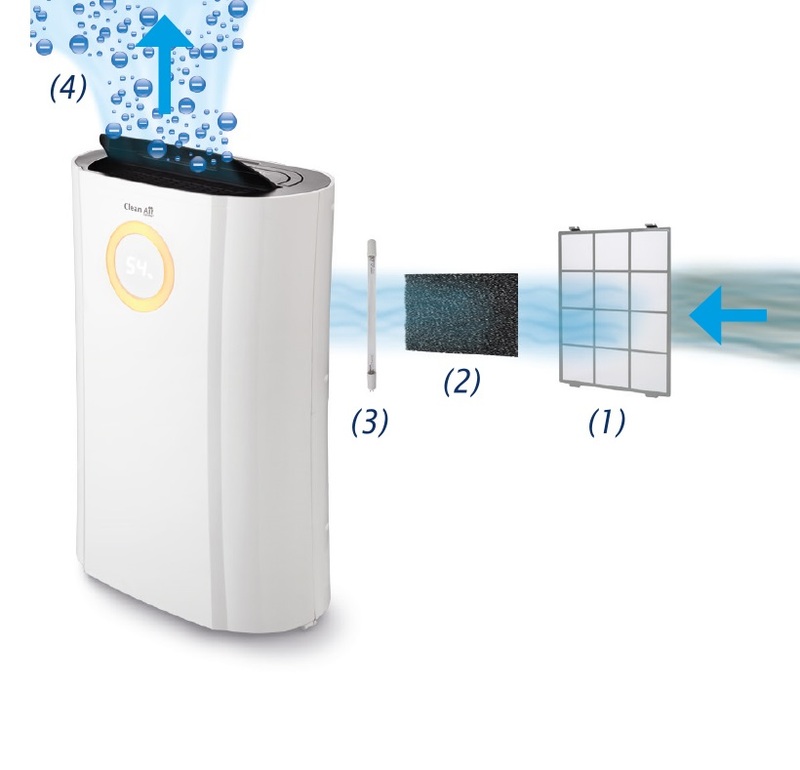 Besides protecting against mould spores, this multifunctional dehumidifier CA-704 by Clean Air Optima liberates indoor air from annoying animal hair, pollen, dust, bacteria and odours with its integrated continuously and efficiently working air purifier with quadruple filter technology. Patients suffering from allergies can finally breathe deeply again! 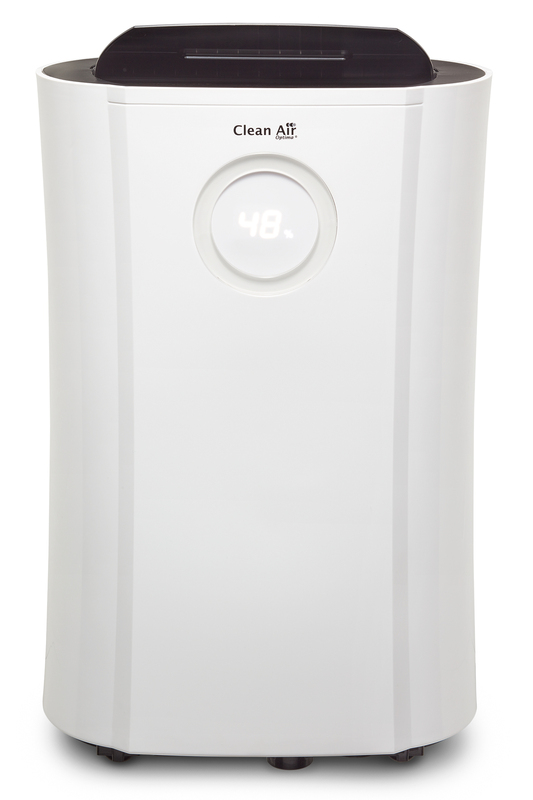 The slim shaping in an exclusive design and the neutral colouring of this compact dehumidifier fits into every interior. With its integrated humidistat, the condensation dehumidifier CA-704 by Clean Air Optima is perfectly suited for automatic air dehumidifying. It suffices to set the desired humidity and this efficient air dehumidifier takes care of the rest. The 2in1 system for air dehumidification and air purification of the CA-704 provides optimal indoor air climate all year long: if the set relative humidity has been reached, dehumidification stops, but air purification continues. The continuously working air purification of the multifunctional CA-704 by Clean Air Optima liberates indoor air from allergens, mould spores, annoying animal hair, pollen, dust, bacteria and unpleasant smells all year long. 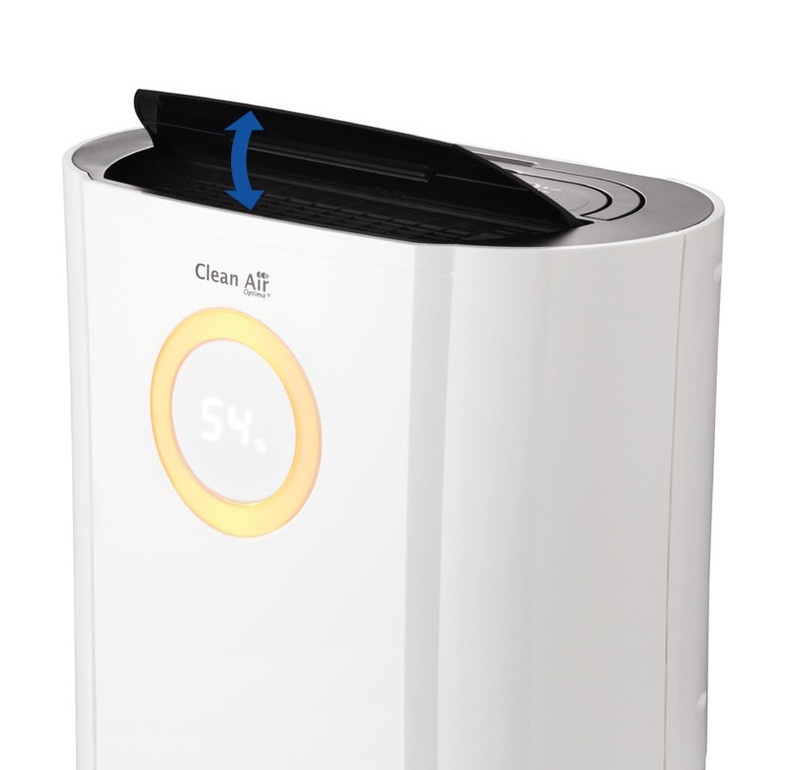 The Clean Air Optima CA-704 realise healthy indoor air climate by advanced technology with multifunctional 2in1 system for air dehumidifying and air purifying. The compact and powerful condensation dehumidifier CA-704 by Clean Air Optima with the 2in1 system for air dehumidification and purification withdraws excess moisture in rooms up to 40m² / 100m³ / 430ft² with a capacity of 10 litres/day (30°C/80% RH - Relative Humidity) and actively prevents the formation of mould, corrosion, stains and mustiness. This protects the building structure and your health. The condensation dehumidifier with compressor technology is the most frequently used dehumidifier on the market and the CA-704 can be used within a temperature range of +5 to +35°C. 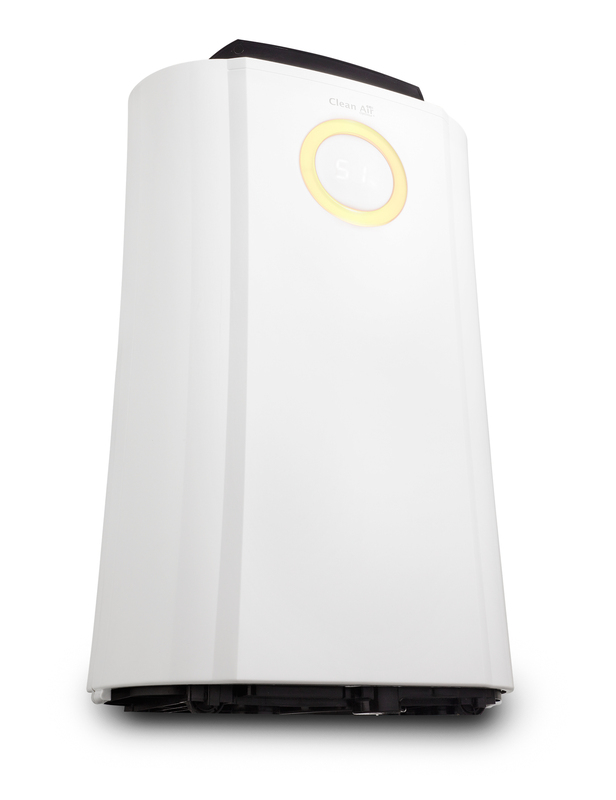 This efficient dehumidifier is equipped with a compressor which conducts humid indoor air along a cooling element. Humid ambient air is quickly cooled down this way. Humidity in the air condensates because low temperatures mean less humidity in the air. Condensation is collected in a water tank or can be directly drained by connecting the included hose. The pre-filter catches big dust particles like dust bunnies, hair and pet dander. Activated carbon neutralises smoke, chemicals, gas and smells, prevents the development of bacteria, virus and mould. The ultraviolet light of the lamp (UV-C radiation) with a wave length of 254nm eliminates health damaging microorganisms like germs, viruses, mould (mould spores) and bacteria. UV light possesses the highest frequency, the shortest wave length and hence contains the most energy which radiates through the outer membrane of the organisms and destroys its DNA. Thousands of such installed devices with their integrated UV technology in the entire world prove that UV radiation is highly effective against pathogenic viruses, bacteria and unicellular organisms. Using UV light leads to microbial deactivation rates of 99,99% or higher. No replacement UV-C lamp necessary. Capacity > 3.000.000 negative ions/cm³ that spread in the entire room and thereby neutralise harmful substances and smells. 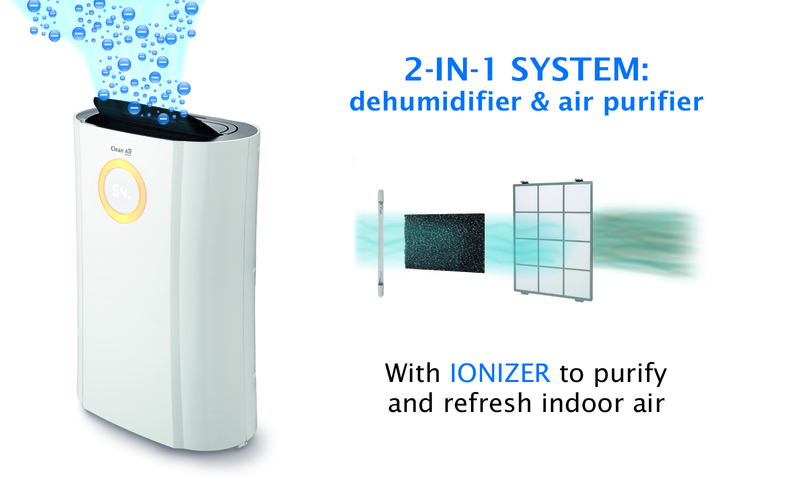 The ionizer produces negative ions for the purification of indoor air and its enrichment with active oxygen. Unpleasant smells are neutralised and harmful substances in the air are eliminated. Negative ions also have a strong antistatic effect. If the set relative humidity is reached, the dehumidification stops but the purification stays active. Integrated humidistat for automatic air dehumidification. Colour monitor to determine relative humidity. 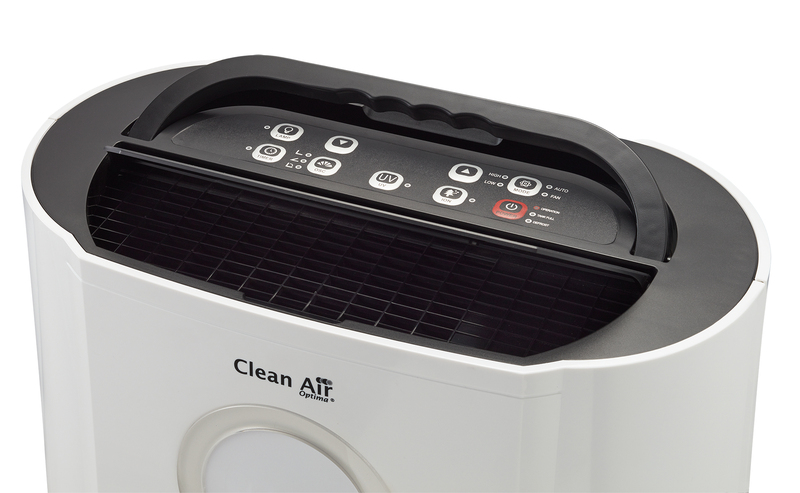 The condensation dehumidifier CA-704 by Clean Air Optima is equipped with an integrated humidistat to measure, control and set relative humidity. The desired humidity can be set between 35 and 80% RH (Relative Humidity). This dehumidifier is pre-programmed to attain the optimal humidity of 55% RH advised by medical specialists. When programming the minimum value of 35% RH, the device works continuously and stops automatically as soon as the water tank is filled. The ingenious design communicates humidity via the round colour monitor on the front of the device. Default optimal humidity is set to 55%. as soon as the water tank is full. through the defrost function connected to a sensor. Keeps the original settings after restart. Automatic restart if power failure occurs. or stay fixed at 45° or 90°. the device if the water tank is full. 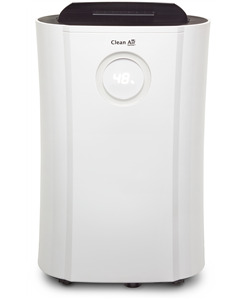 The condensation dehumidifier CA-704 by Clean Air Optima transforms humid and unhealthy indoor air into clean and healthy air. The oscillation flap moves in an angle of 45 to 90° guarantees good air circulation and optimal spreading of purified air in your room. The flap can be fixed at 45° - 90°. volume of 4 liters and is equipped with a handle. After opening the revolving door on the back of the device the tank can be easily removed. The condensation, caught in the tank can be directly drained if the included hose is connected. This makes the dehumidifier CA-704 ideal for continuous usage without supervision. 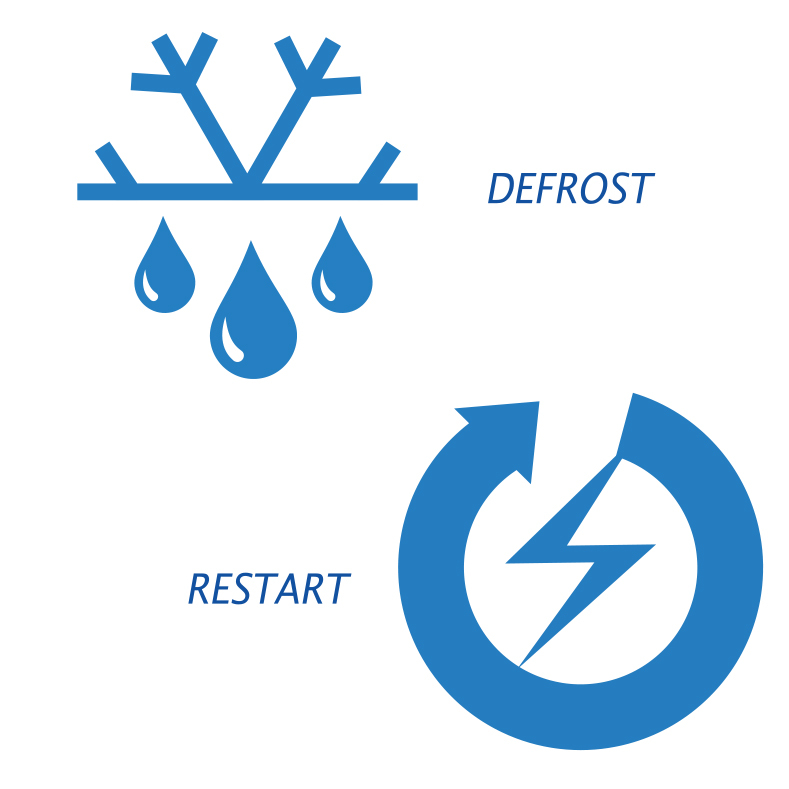 If the device is restarted the dehumidifier continues to work automatically and keeps the settings. If power failure occurs the device restarts automatically and keeps the settings. Dehumidifiers can be separated into two categories, namely condensation or adsorption dehumidifiers. The most common dehumidifiers are condensation dehumidifiers, also called compressor dehumidifiers. 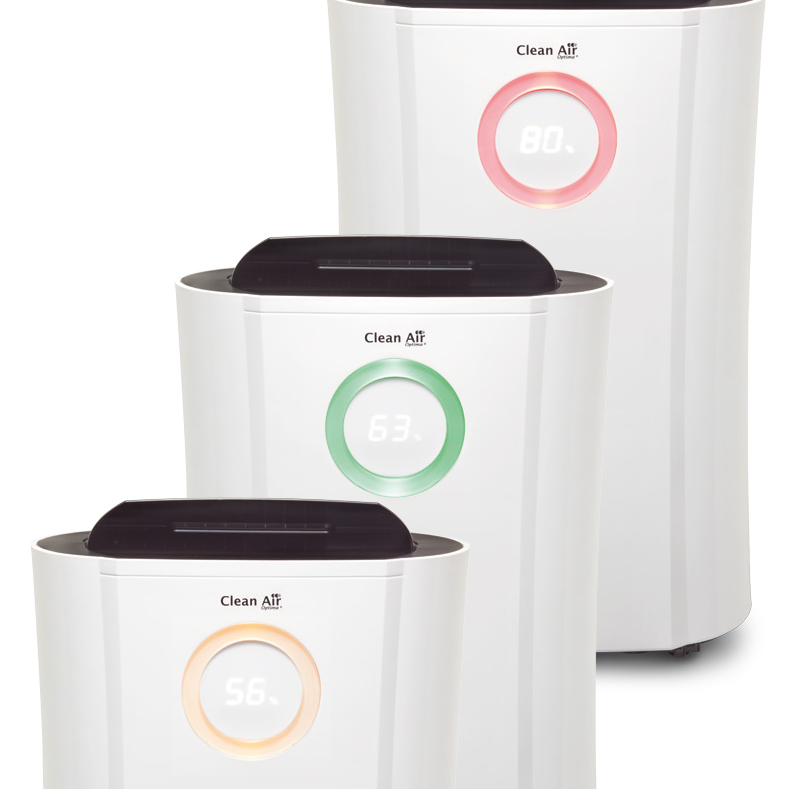 The Clean Air Optima® assortment possesses two types. These electric dehumidifiers are used to withdraw moisture from apartments, offices, public buildings, farms, warehouses, museums etc. etc. They are very useful over winter periods in living rooms and sleeping rooms, for summer in basements, ideal for drying laundry and usage in holiday flats, caravans or campers. The big advantage of the condensation dehumidifiers with compressor is that they need 25 to 60% less energy than adsorption dehumidifiers. The costs for acquisition of the condensation dehumidifier can be easily amortized. 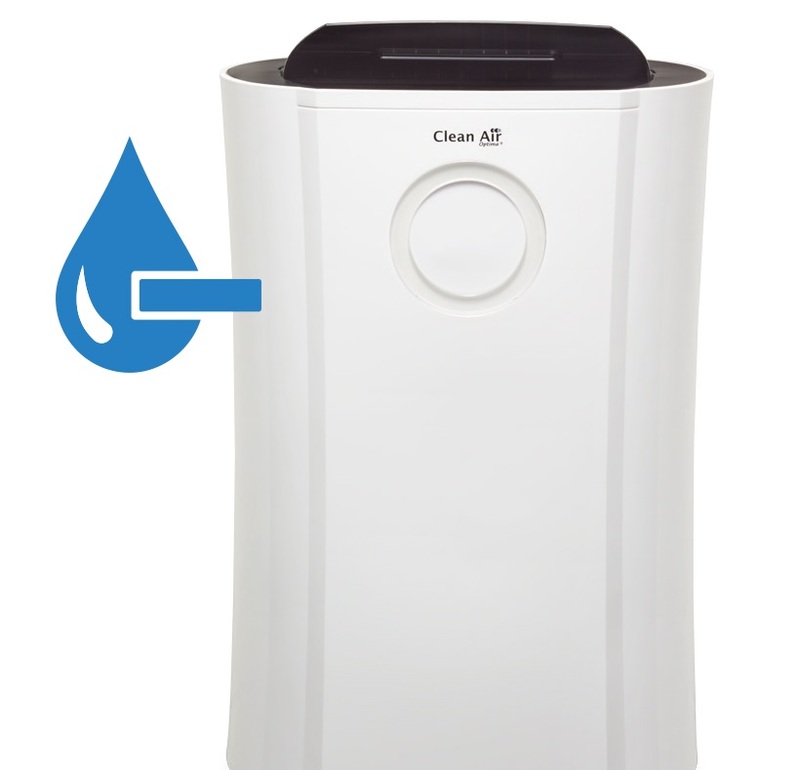 The condensation dehumidifier CA-704 by Clean Air Optima possesses a handle, robust wheels and can easily be moved from one room to the other. 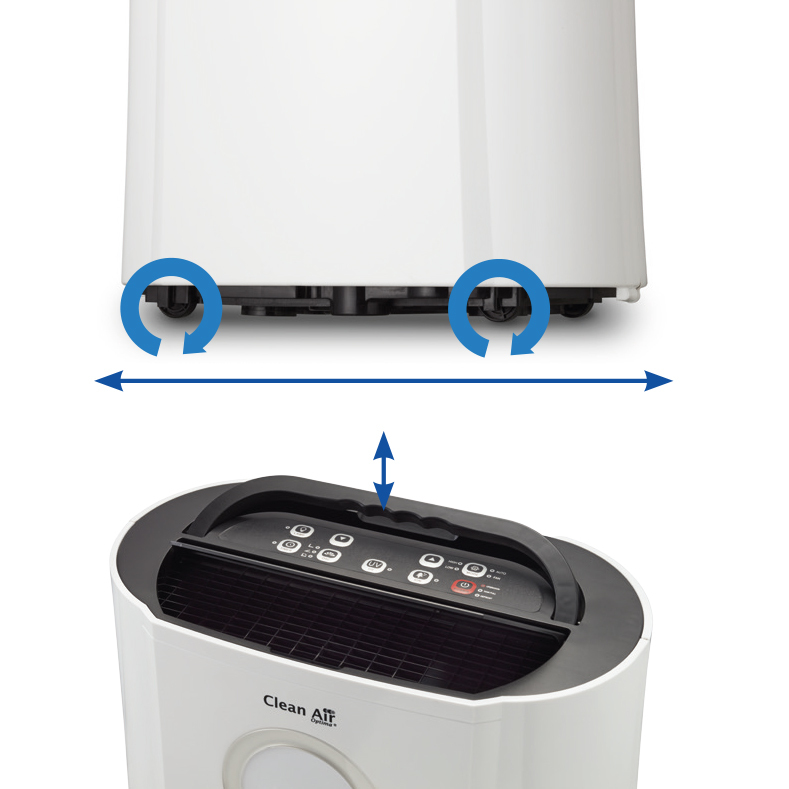 The dehumidifier CA-704 by Clean Air Optima with its 2in1 system for air dehumidification and purification supports laundry drying. 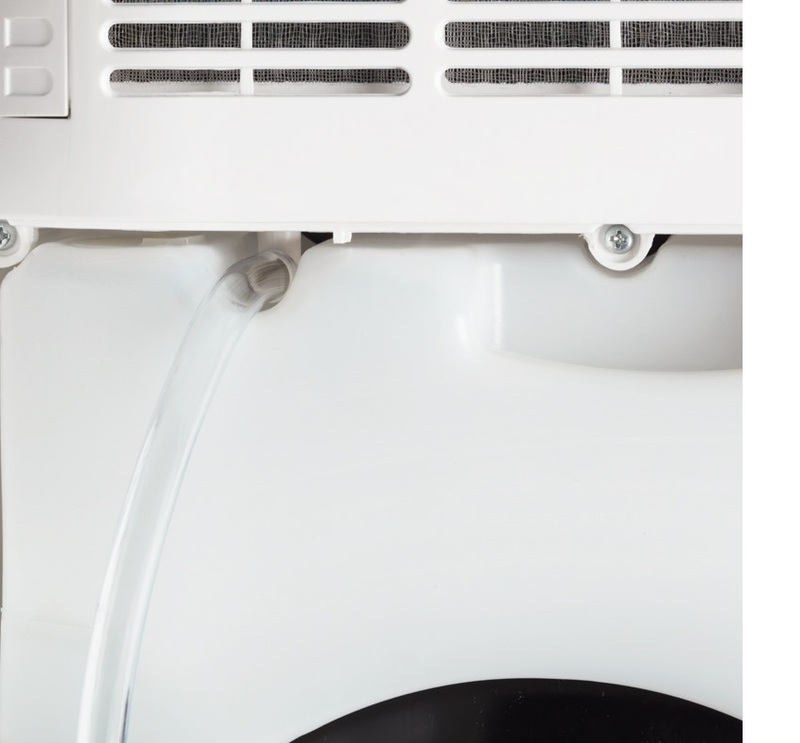 The swing function moves the oscillation flap in an angle of 45 to 90° and creates good air circulation in the laundry room. The working dehumidifier also emits some heat into the laundry room. This combination generates a laundry drying effect. In comparison to a tumble dryer, this is an energy saving and environmentally friendly method of laundry drying. The prefilter catches big dust particles like textile fibres and dust bunnies in the laundry room. The activated carbon filter neutralises smells. The negative ions produced by the ionizer during the drying process of the laundry additionally have an antistatic effect. • Can be used within a temperature range of +5 to +35°C. Clean Air Optima condensation dehumidifier CA-704 very useful over winter periods. The condensation dehumidifier with compressor technology is the most frequently used dehumidifier on the market. Too much moisture in the air can create an unhealthy environment and cause a range of issues including condensation, damp, bad odours and mould. Daily household activities such as cooking, taking a shower, using a dishwasher or washing machine, can increase humidity levels in the home. Dehumidifiers help to reduce the amount of moisture in the air. The optimal humidity level in a domestic environment and for example offices is 50-55% RH (Relative Humidity). 50% RH means that the air contains only half of the moisture it can hold. As temperatures decrease the amount of water in the air may remain constant, but the relative humidity (RH) will dramatically increase. This makes dehumidifiers very useful over winter periods. Basements are as prone to damp and mould issues as bathrooms and kitchens but whereas the later usually suffer in the winter for basements this is a summer problem, especially mould growth in the summer months. In the summer months the warm outside air is carrying more moisture than it does in the winter months. The basement, because it is below ground, is cooler than the rest of the house and is cooler than the outside air temperature. The warm air from outside enters the basement through open windows and when it comes into contact with the cooler surfaces in the basement it’s humidity will increase and mould can grow. The mould will grow on surfaces that are organic based. In a basement this is likely to be: wooden beams, soft furnishings and storage from boxes, papers, books, clothes etc. Humidity in the summer can cause a lot of damage in basements in a very short period of time. As this is a summer application a good advice about the most suitable model is important. What you don’t want to do is to increase the room air temperature in the basement in the summer because it will be warm enough. This is why desiccant dehumidifiers are not generally used in basements in the summer months. The Clean Air Optima condensation dehumidifier CA-704 with compressor technology is the most frequently used dehumidifier for prevention against mould grow on surfaces that are organic based. 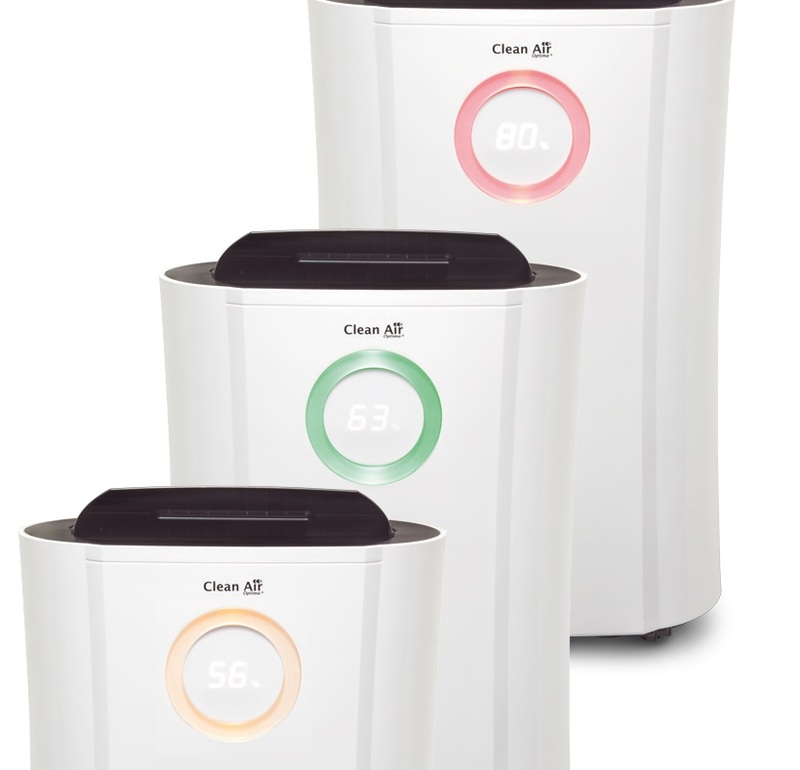 The powerful condensation dehumidifier CA-704 by Clean Air Optima with the 2in1 system for air dehumidification and purification can be used within a temperature range of +5 to +35°C. The CA-704 is an energy efficient compressor dehumidifier, one that will be perfect for summer use in basements because this system extract lots of water but use very little electricity. This versatile dehumidifier CA-704 actually is an all-rounder and can not only be used to dehumidify rooms up to 40m² / 100m³ / 430ft², but is also an efficient air purifier and supports laundry drying. 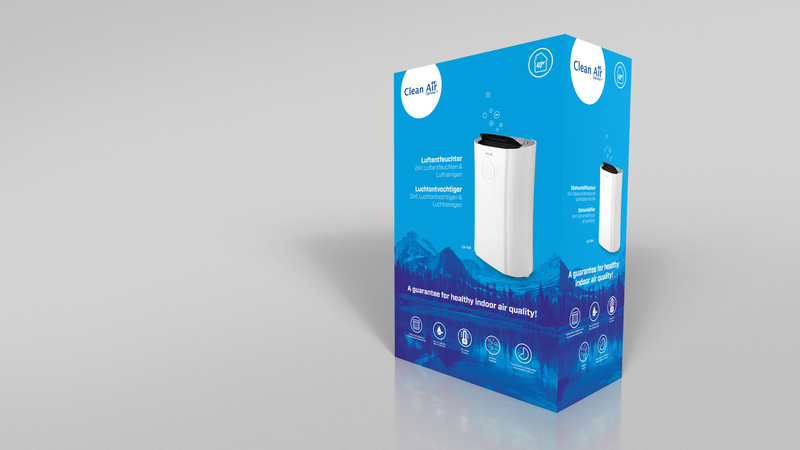 The quadruple filtering technology (prefilter, activated carbon filter, UV lamp and ionizer) produces clean and healthy air. This powerful condensation dehumidifier withdraws 10 liters of humidity from indoor air per day when the temperature is around 30 °C and RH 80%. Humidity is collected in a water tank of 4 liters. 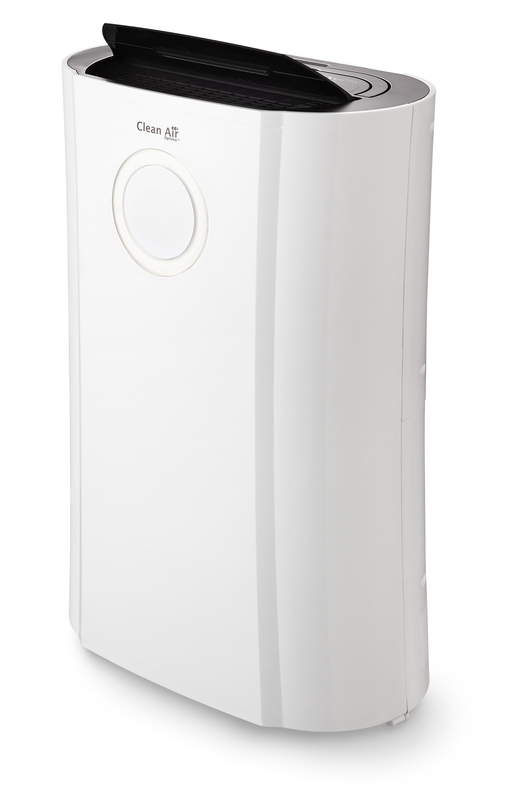 The dehumidifier CA-704 stops automatically if the water tank is full and signals it with a LED. The water can also be directly drained from the tank if the included 3 meter hose is connected. The integrated humidistat and the 3 fan speeds guarantee comfortable automatic air dehumidification. You only need to program the desired humidity and the device takes care of the rest. Thanks to the handle and the robust wheels, the device is easy to move. 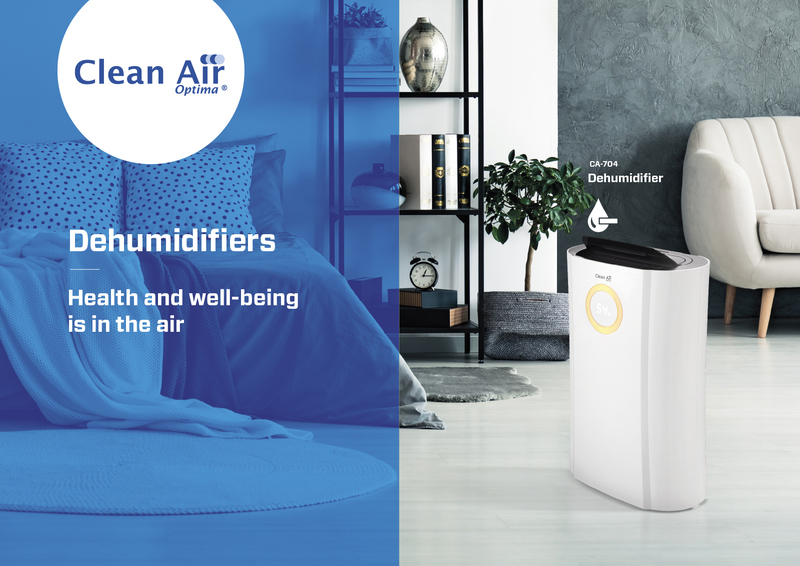 Additionally, the condensation dehumidifier CA-704 by Clean Air Optima contains an ecological refrigerant R134A and the silent operation of the device <39 dB(A) make it perfectly suited for usage in the bedroom or other rooms where silence is required. The slim shaping and exclusive design, the neutral colouring in ivory/black and the silent operation make this compact air dehumidifier and purifier CA-704 suitable for each interior. 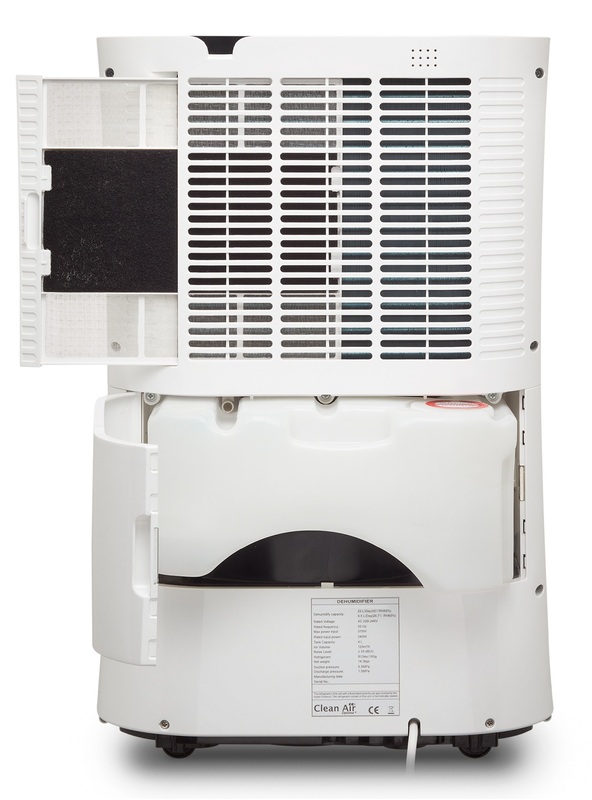 The electric dehumidifier CA-704 is ideal to withdraw moisture from living rooms, bedrooms, children rooms, ideal for summer use in basements, offices, public buildings, sport and fitness centres, spas, farms, stock rooms or museums, can also be used in holiday apartments, caravans, campers as well as for drying laundry. Remove the activated carbon filter from the package and place it in the support of the prefilter. Push it into the back of the device, above the revolving door behind which the water tank is located: as described in the instruction manual. First switch off the device and pull out the plug. Open the small door on the back. After opening it, the water tank can be removed from the device. After emptying the water tank place the water tank back into the device. If the included hose (10mm /3 m long) is connected, water can continuously be drained. Attention: the hose must always be directed downwards and the end of the hose must always be below the water tank in order to avoid damages caused by water. If standard settings and the hygrostat are used and the hose is connected, the dehumidifier CA-704 is ideal for long-term use is room without supervision. (Attention: only place the filter back in the device when it’s dried. Do not clean with water above 40°C, alcohol, benzene or other inflammable substances). Once every 3 months replace the activated carbon filter. Click here to order the activated carbon filter. Clean the outside of the device regularly with a soft, wet cloth. If the dehumidifier CA-704 is not used for a longer period of time, we advise to clean the device and let all parts dry well. The device should be stored at a dry and cool place. Only have had it for two days. The item was delivered fast. It was very simple to switch on and navigate. Looks very smart and the air that comes out of it is fast, fresh and powerful. The tank after day one was half full and the light in front has kept a steady healthy percentage of humidity in the room. There is a simple smart reader in front ( which lights up) that lets you know the humidity in the room and so far it has maintained a healthy percentage. Mine is at 55% which is regarded as a healthy level. Will review later once I have had time to really take it the long mile... Super stuff! 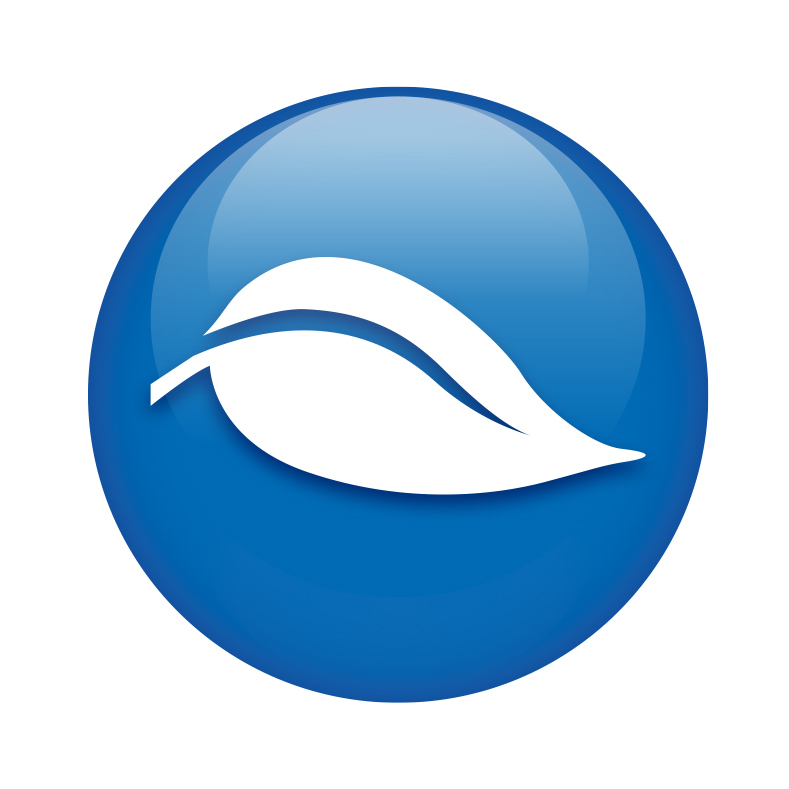 I have bought many dehumidifiers and ionizers from Clean Air Optima for my family home and car. The result is fresher air and reduction in odours. Das Produkt hält was es verspricht - top!